As Christians, hospitality is a key element of our faith. Food and nutrition are at the core of our lives for survival and growth–having the right nutrients are most beneficial for our daily living. 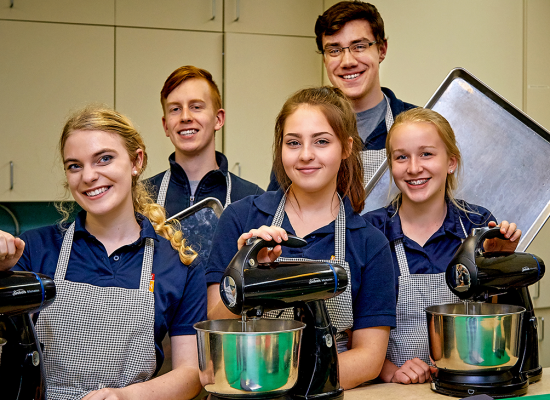 At Hamilton District Christian High, hospitality and outreach are key components of the FOODS program–students regularly prepare meals for members of our community, school cafeteria, special events, staff functions, and those in need who dine at the Olive Branch in downtown Hamilton. While learning the culinary basics, students are also instructed to demonstrate their skills for authentic audiences. We live in a fast-paced world, and the food industry has responded to our culture with a magnitude of processed food options to alleviate time spent in the kitchen. In the HDCH Food and Nutrition course, we step away from this mindset and focus on basic ingredients to create wholesome, healthy meal options. We focus on ways to prepare cost-effective recipes with as much locally grown ingredients as possible. Digging up fresh ingredients in the morning or clipping fresh herbs from our own classroom is the beginning of delicious results. The FOODS program presents a huge learning curve for some students who have never cracked an egg, flipped an omelet or made a main entree. Other students have been preparing meals in their home on a regular basis and are ready to improve their culinary skills and cooking flair. 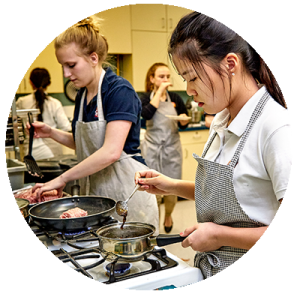 The amazing part of the program comes from the blend of these two extremes as we enhance our culinary skills together, try new recipes, and learn more about healthy choices and nutrition. 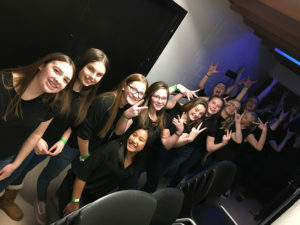 Also included in the Hamilton District Christian High FOODS Program is the Knight’s Eatery Cafeteria and our Special Events team. 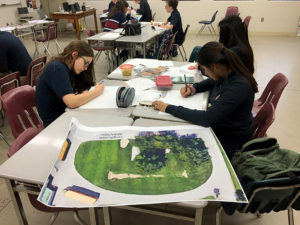 As such, the FOODS room, kitchen, and cafeteria are constantly in a whirl of action with cross-curricular culinary experiences, daily meal prep and weekly events. Evelyn Hielema, Director of Cafeteria Services, is constantly working with different menu ideas, plans, and student staff to make our lunch hour run smoothly. Marcia Hosmar is the new Special Events Coordinator and oversees fabulous functions and fundraising dinners. This past March, HDCH held an ‘Awaken Your Tastebuds’ Dinner with the intentions of raising money to purchase much-needed culinary tools and equipment. With the support of our giving community, the evening generated just over $10,000. 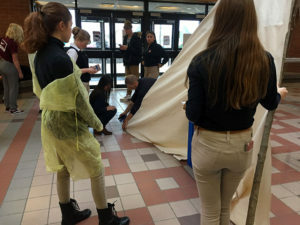 By incorporating the Biblical imperative of tithing, 5% of the proceeds were directed to Wesley Urban Ministries to support high-school aged refugees purchase the items needed to attend school in Hamilton, while the other 5% was donated to the Ancaster Community Food Drive to support the Neighbour to Neighbour (N2N) Centre food program. The original HDCH school building on Athens Street is the location where this N2N outreach program is located, which is another unique connection to this local mission. With the money that remained, HDCH was able to purchase a new Garland double oven and grill and a Blodgett convection oven for the kitchen. Alongside these two pieces of equipment, various culinary tools were purchased that included: several new cutting boards, four stand-up mixers, large cookie sheets, Pyrex pie plates, a cast iron skillet, spiral vegetable cutter and various sizes of good quality Henkel knives for food preparation. 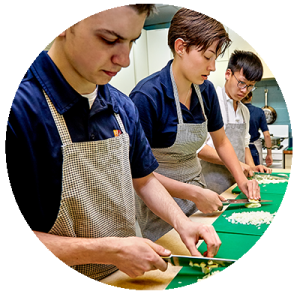 It was through the passion of our students preparing main entrees from the FOODS program, the generosity of our International Guardian, Alice Murakami, along with L & C Catering, Tim Horton’s and Epicure, that everyone in attendance could enjoy this wonderful marché-style gala event. We are so thankful for the generosity of our community with their support of the FOODS program as we use this new equipment on a daily basis.